What kind of work do we do? Basically anything that needs fixing on a car, we fix it. 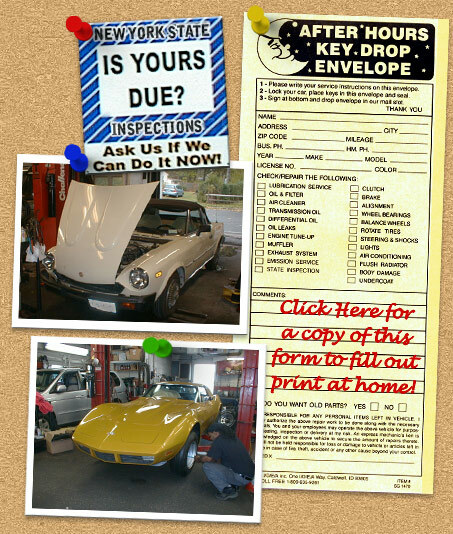 All engine work for cars foreign and domestic, inspections, tune-ups, oil changes, inspections (Is Yours Due?) tires, body work, even classic car restoration. I guess the better question is – what don't we do? – because we do it all, whatever our customers in the Greenlawn, Centerport, Huntington, East Northport area need. We always do right by them. We don’t just fix cars; we talk it through with our customers so there are no surprises. First, we diagnose the problem; then we discuss the solution; and only then, do we present an estimate of cost to our customer. We've found over time that this is the best way to keep a bond of trust between us and our customers.